Craving juice and smoothies? You're in luck: a new business has opened its doors in the Tacony neighborhood. 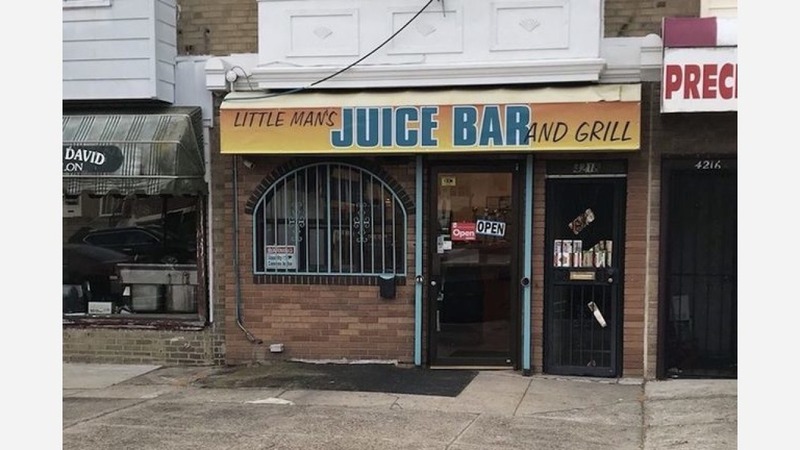 Called Little Man's Juice Bar and Grill, the newcomer is located at 4218 Princeton Ave. in northeast Philly. With a bright orange counter and metal sheeting lining the wall behind the smoothie and juice makers, Little Man's offers an extensive list of smoothies, juices and parfaits. Customers can build their own or choose from a menu that includes "Anemia" juice (apple, carrot, celery and kale); an acai smoothie bowl with blueberry, granola, almond milk and honey; and the strawberry and blueberry parfait made with Greek yogurt. Add-ons include honey, hemp seeds, granola and, for those looking for an extra kick: cayenne pepper. The fresh new arrival has a 4.5-star rating on Yelp, with just two reviews thus far. Heather L., who was the first Yelper to review the new spot on March 19th, said, "Not the prettiest-looking smoothie, but created my own with mango, pineapple, strawberry and spinach. Ingredients are fresh, taste good and staff was friendly and helpful."